Three days ago, The Artist won the 2012 Academy Award for Best Picture. And so, we celebrate. It may be a long time before another silent film pulls this off. It was 83 years between The Artist’s victory and that of the only other silent to win it: William Wellman’s Wings. If you’re a fan of this blog, you probably know a bit about Wings, which pops up in Oscar trivia all the time. The film won for two years, not one; it was Best Picture before the award was so named. It was a gargantuan popular hit in its own time, and yet, has been hard to find on video ever since, until this year. The following is not based on a viewing of the (purportedly spectacular) new Blu-ray edition of Wings. Instead, I saw the movie live, on film, in a Toronto theatre—on the day of the Oscars, appropriately enough. I’m glad I went. This is a big flick, and it needed the space to move around. Wings starts on the ground. With a love triangle between innocents in a small town. This would be a typical beginning, not notable at all, but for one fact: the girl being fought over is not Clara Bow. 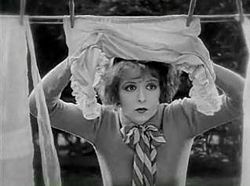 Bow’s a big part of the film, you see: playing Mary Preston, a girl in love with her neighbor, Jack. That Mary, who looks no different than Bow always does, could be invisible to Jack (Buddy Rogers), or anyone else, is a leap of faith that Wings demands of us. Jack drives fast, and leads with his heart. And he loves another. He’s almost aggressively naïve about that—if he wasn’t, he’d see that the girl in question, Sylvia (Jobyna Ralston) loves David (Richard Arlen) instead. David is wealthier, better looking, and graver than Jack, but to the movie’s credit, none of this makes him a villain. They will grow to be the best of friends. Sylvia, she’s just a plot-point anyway. Clara matters. 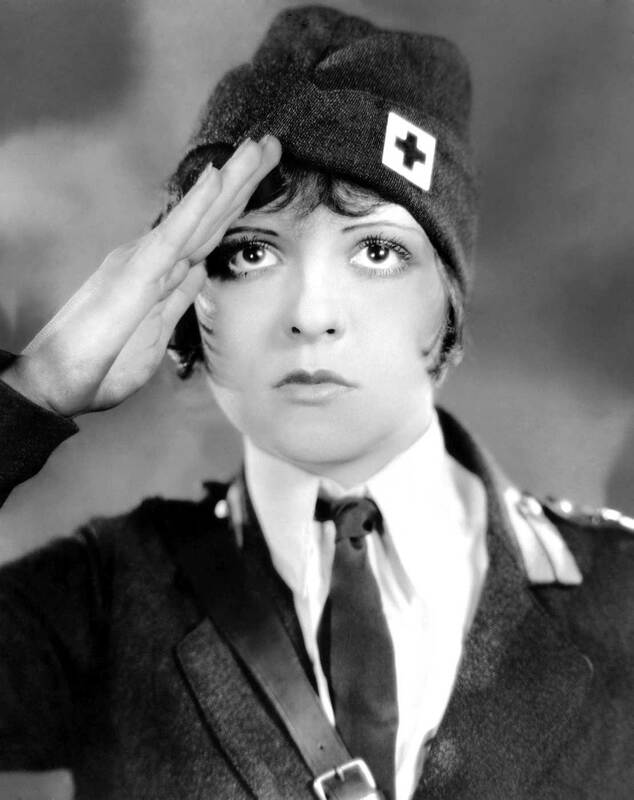 Clara Bow: her craft and career in full bloom, single-handedly carrying the film’s first act. In Wings, we see Bow’s great gift, which she could have executed with even half the beauty she possessed: her ability to tether extreme emotional states together with the subtlest threads; adding intensity, gravity and balance to essentially comic roles. Mary Preston is semi-competent most of the time, and her puppy-love is the film’s big joke early on, and yet… Bow solidifies her. She does this by keeping Mary constantly on the verge of being totally crushed. It works. It’s nuance composed of wild swings. David might be ahead of Jack on points by the time of the draft; it depends on your point of view. But either way, things are about to change radically for all three noobs. It’s 1917 and the U.S., finally, is entering the First World War. And Wings, finally, begins its transformation into the film it is remembered as. 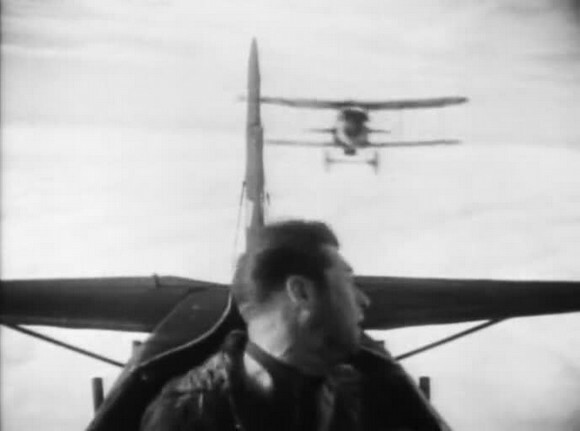 Wellman was a fighter pilot during the Great War (as were Arlen and screenwriter John Monk Saunders). Now, an artist in a time of peace, he set out to make a movie that not only depicted the dogfights he remembered, but expressed the feeling of being aloft. His camera doesn’t just point skyward—it travels there. The combat in Wings occurs in a space bounded by sky above it, and around it, and by clouds below. We look down upon planes flying 10,000 feet in the air. Jack and David, now pilots, charge the camera head on, emptying their guns as though the enemy they saw was us. Pilots are shot in their seats; as they bleed, the planes seem to bleed as well, streaming long tails of smoke as man and machine dive toward their shared destruction. Planes fall a long, long way in Wings: through one platform of cloud and the next and the next; ejected from an aerial battleground so far removed from the earth that even a death spiral lasts minutes. In Wings, there truly is an Up There, and a Down Here, and they do not feel connected; something I’m confident Wellman was basing on his own memories. But the division is more than impressionistic or even literal. It’s metaphorical. Up There has its own, rarified nobility; it’s where Capt. Von Kellermann, a stand-in for Germany’s real-life flying ace, the Red Baron, declines to shoot David out of the sky because his foe’s guns have jammed. It’s where biplanes bank upward in such a way as to remind us they’re shaped like crosses. Down Here, men in trenches are crushed into the mud beneath tank treads. And they display their venality. There could be no sharper juxtaposition to Wings’ aerial duels than the scene in the Paris club, when blind-drunk Jack (on leave) is saved from certain court-martial by Mary, now serving overseas as an ambulance driver. Rogers, who spends the scene fixated on champagne bubbles (helpfully animated), seems a bit too broad here; the scene’s more irritating than funny. It is necessary, though, for Bow, who cannot participate in the combat scenes in any way. She does better than Rogers, but, this was her element. I don’t think Wellman cared much about the bubbles-scene. I don’t think he cared about combat on the ground, either; for those scenes lacked life, as though the artillerymen and their victims weren’t really connected. 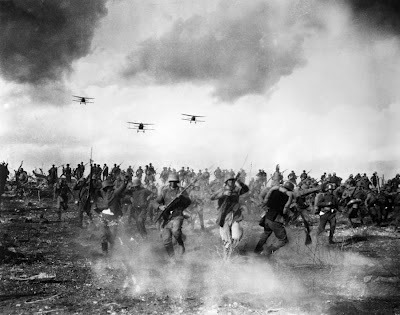 Compare them to a late moment, when a pilot gone berserk rains death from above upon fleeing soldiers, and even a carload of officers—Wellman clearly knew how to inject passion into scenes of horrific violence. He just didn’t extend that talent to filming trench warfare. I have other complaints. Richard Arlen is restrained to the point of constipation; showing far less charisma than his role—as foil, but not villain—required. He can’t even glower. A young Gary Cooper, famously onscreen for less than three minutes, delivers a more potent performance in that time than Arlen manages in two hours. There’s also a running theme, which grows stronger toward the end of the film, that bugged me a bit. Declaring “it’s war” as a justification for wrongdoing might cut it for matters of infidelity or theft, but I don’t think it absolves one of murder on a massive scale—perpetrated, mind you, not by armies, but by single individuals who have the means. I’m sure Wellman and Saunders knew perfectly well the consequences of warfare, and nowhere in the film is it suggested that war takes no psychological toll. However, I’m also not sure what their definition of “war-crime” would be. The real reason for this theme, probably, is Wellman’s need to sew things up. Epics don’t do ambiguity well, and Wings is one-third romantic comedy, on top of that: concluding on the brink of abyss just wouldn’t be fair. This is a movie about exuberance and hope, sorely tested. In that regard, it’s much like history’s (only) second silent Best Picture. Read my review of The Artist here. Paramount’s newly released Blu-ray edition of Wings is receiving rave reviews—Alicia Fletcher, the Toronto International Film Festival's Digital Coordinator for Adult Learning, who spoke prior to the live screening I attended on Sunday, described it as the best restoration she’d ever seen. I intend to see it myself this year. My own Wings experience was courtesy Revue Cinema’s Silent Sundays series, programmed by Toronto’s Eric Veillette. Live piano accompaniment was provided by William O’Meara. I too first experienced WINGS in a 35mm screening at a theatre BUT the sound track score was made up of music from records of the twenties. It would have worked better if the sound track had been turned off. In spite of that drawback I thought that WINGS was an excellent film. The current Blu-ray is a marvel with an excellent organ score and an even better orchestra score with sound effects. Clara Bow of course is the female star but the girl I was attracted to was Jobyna Ralston. I had no idea who she was or what else she had appeared in until years later when I became familiar with the Harold Lloyd features. She is just as wonderful in the six Lloyd features as she was in WINGS. In fact, like Leonard Maltin, I always felt that Lloyd should have married her in real life. As to WINGS being the first and only Best Picture Oscar winner until THE ARTIST I would disagree. SUNRISE was just as much the winner that year as WINGS even though the Academy has chosen to honor WINGS exclusively. WINGS was a wonderful commercial film and SUNRISE was the artistic masterpiece of the same year.